All right, fashion reporting isn’t my bag. While watching last night’s Emmys red carpet instead of pondering who/what people are wearing and how they’re accessorizing (ear cuffs! 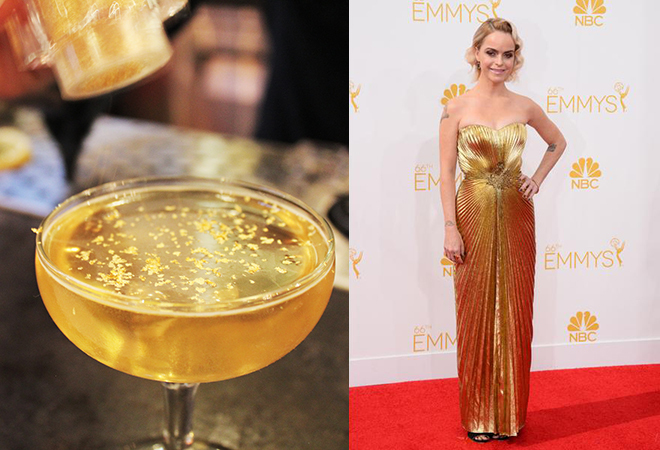 ), I preferred to play a little game of “if that designer gown was a cocktail, which would it be?” (I was inspired by my former colleague’s delicious list of Dessert Dopplegangers from last year’s Emmy’s.) Seriously, if you wondered why you were getting thirsty watching the Emmys step and repeat, it’s because a lot of the couture resembled L.A. cocktails. 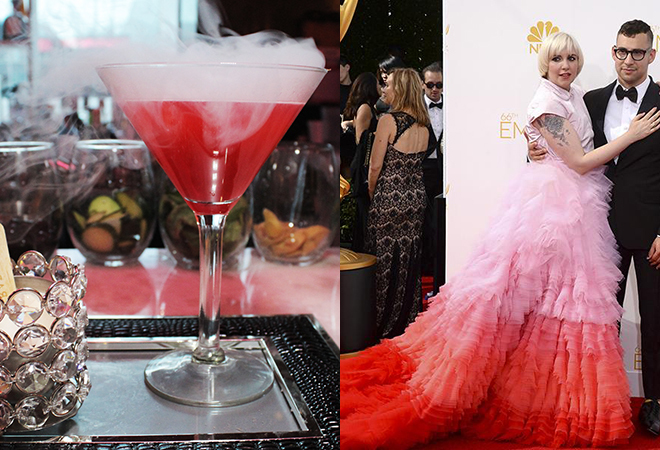 Whether you were intrigued by or hated Girls’ Lena Dunham’s pink and red tulle Giambattista Valli Couture (I’d totally love it if I were a tiara-wearing two-year-old), it looks a lot like Barton G’s equally over-the-top liquid nitro cocktail Buddhalicious (pear-infused vodka, lychee and cranberry juice, pear vodka nitro pop). You really don’t need that extra flair but it sure gets people talking. Manning went the glamorous Marilyn Monroe route and sported a vintage strapless gold Azzaro gown which looked like it was made of the very same edible gold flakes used in Gracias Madre’s $50 El Dorado cocktail. 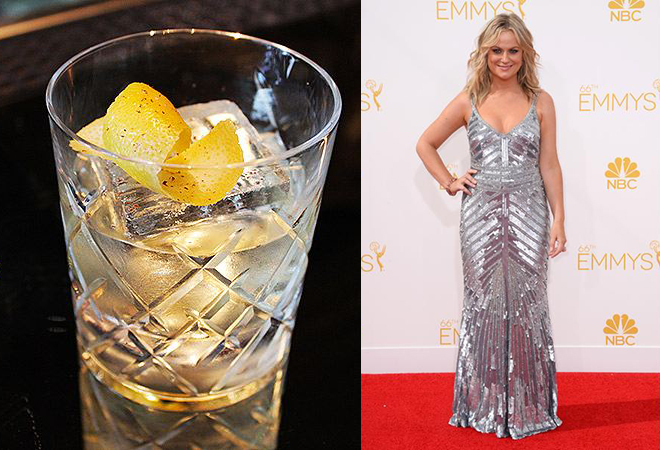 Comedian Amy Poehler’s shimmery silver Theia Couture gown emoted Faith & Flower’s English Milk Punch especially since the cocktail is served in a gorgeous etched crystal tumbler which appears to come right out of the Gilded Age, too. 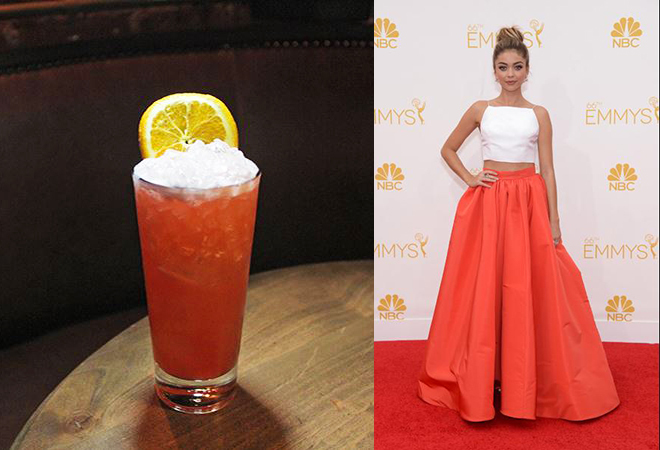 Now I defy you to deny that the combination of Modern Family star Sarah Hyland’s chic top bun and Christian Siriano white midriff-baring top and full orange skirt does not echo the Chestnut Club’s Chestnut Cup (Gin, Campari, lemon, orgeat, bitters). Because it does. Right down to the orange wheel garnish/bun. Cute!